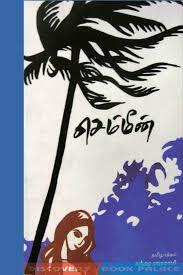 A few years ago, I got a chance to read Sundara Ramaswamy’s Tamil translation of the Malayalam novel Chemmeen, written by Thakazhi Sivasankara Pillai. Chemmeen holds an important place among books that made me a serious reader of literary fiction. Recently, I came to know of the film adaptation of Chemmeen, and so with great enthusiasm, I decided to watch this movie, first released in 1965. The novel was adapted to a screenplay by S.L. Puram Sadanandan, and directed by Ramu Kariat. A fantastic effort! Given that the culture of adapting novels into movies is almost non-existent in Tamil cinema, it becomes necessary to talk about a movie like Chemmeen. For it isn’t an ordinary movie; it has attained exalted status in Malayalam cinema. 2015 marked the fiftieth year of this movie, which witnessed many celebrations among film audiences in Kerala; truly a film that has found a secure place in the hearts of Malayalis. Chemmeen follows the story of Karuthamma, a woman living in one of the many fishing villages along the Arabian sea. She has harboured feelings for her employer’s son Pareekutty since a young age. At one point, these feelings morph into love. 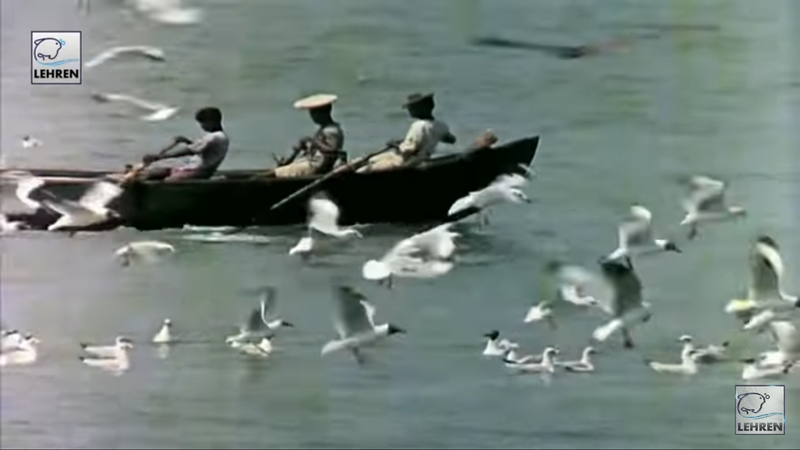 Karuthamma’s father Chembankunju, an ambitious fisherman, makes use of the situation and borrows a large sum of money from Pareekutty for a new boat. However, he is unable to return this money, and Karuthamma eventually gets married to someone else. What happens as a consequence of these events forms the rest of the story. It appears as though the novel’s structure did not have to be altered much to create an engaging screenplay. The storyline lends itself beautifully to a screenplay. Many scenes were portrayed in the film exactly the way they were written in the book. But having read the novel in Tamil, and watched the movie in Malayalam, I am not sure if the dialogues are an exact reproduction as well. I can say without a doubt though, that the novel’s beginning, plot points, and climax follow the same arc as the book. Madhu, who plays the role of Karuthamma’s Muslim lover Pareekutty, brings to mind that other lovelorn figure of Indian cinema, Devdas. The solitude, the singing, the grief that follows him everywhere; Madhu’s body language as Pareekutty is stunning. 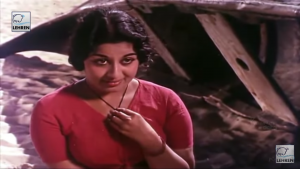 But it is Sheela’s performance as Karuthamma that uplifts the movie. 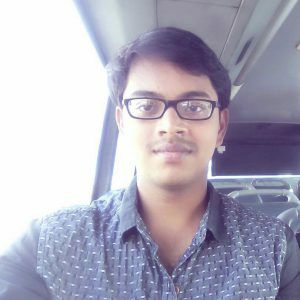 Numerous male leads have nursed love failures in Tamil movies through the years. But Thakazhi Sivasankara Pillai and Puram Sadanandan present to us, through Karuthamma, a woman who is strong and willful, with a great depth of character. Love failure is often seen as the domain of men in Tamil movies, and society; and in such a cultural context, Chemmeen is a reminder that the heartaches of women deserve to be spoken about too. Without the freedom or the circumstances to openly mourn their failed relationships, women are forced to lock away their sorrows, and Chemmeen depicts this distress evocatively. The movie provides the viewer with an experience that cannot be gleaned from the book, through its visuals and music. In spite of the commentaries and descriptions in the book, watching the lives in this tiny fishing hamlet unfold on the big screen is a spectacle in itself. Especially for someone who has never seen with his own eyes a boat, a live fish or a fishing net, the mind’s eye cannot create accurate images from merely the words on a page, even if these words might be very well written. In this manner, the movie holds its own, notwithstanding the novel that was its inspiration. 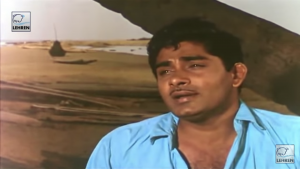 Salil Chowdhury’s background score and songs for this movie are both stellar. After Ilayaraja’s arrival in the 1970s, Tamil music could be heard with much more frequency in cinema. Until then, the music of a North Indian based system held sway. But even in 1965, Salil Chowdhury brought attention to regional South Indian music. Instead of using his music as interludes between dialogues, the filmmaker Ramu Kariat used it in such a way that it perfectly aligns with the film’s mood. 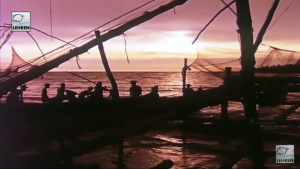 For instance, at the beginning of the movie, in the scene where Karuthamma and Pareekutty are conversing on the shore, we do not hear any sound except the gentle crashing of the waves. But towards the end of the movie, as these characters meet the depths of their despair, the scenes moves along with the help of sorrowful background music. As this music comes together with Madhu and Sheela’s stirring performances, the viewer feels their distress viscerally. The recurring dialogues about women’s chastity and propriety come across as regressive. While reading the novel, it is possible to understand these lines as a product of the characters’ lives and surroundings; but they tend to grate in the movie. In spite of this, Chemmeen still counts as a progressive movie, simply for focussing on a woman’s love and yearning. The novel takes care to explain in much detail the life of Karuthamma’s father, Chembankunju. Through these details, we are able to understand the lives of the others in that fishing village. This was missing in the movie. His burning ambition and greed for a new boat, and the changes we observe in him after he achieves this; these events are superficially touched upon in the movie. But even as I say this, I understand the constraints and limits of the medium. Through our knowledge of Chembankunju’s life, the novel enables us to understand the everyday difficulties a fisherman faces, his way of life, and his relationship with the larger society. These form a treasure trove of knowledge about the culture and milieu of fishing villages along Kerala’s coast. When transposed to film, these anthropological observations take a backseat. Karuthamma and Pareekutty’s love is pushed to the forefront instead, thereby allowing Chemmeen to be categorized as a romantic movie. However, the movie doesn’t deviate from the novel in any major way. 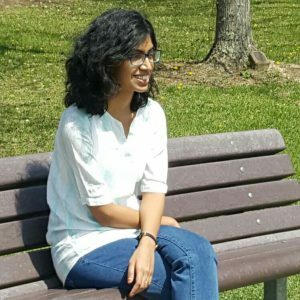 Initially introduced to us as an innocent girl frolicking along the shores of the sea, we see how Karuthamma changes once she realizes her feelings for Pareekutty. After she is married off to another man, we see how she eventually gets over her sorrow and starts to love her new family. But the society doesn’t allow her to move on with her life, it constantly picks at old wounds, never letting her forget her relationship with Pareekutty. Pareekutty, blinded by his love, loans an enormous sum to Chembankunju, who fails to repay the debt, leaving him with nothing. A boy born into wealth, Pareekutty is pushed to committing suicide when faced with destitution. On the other hand, we have Chembankunju, who starts out as an ordinary fisherman; but with the new wealth that he keeps acquiring, his humanity erodes little by little. Change is the only constant, the novel seems to tell us, and this spirit is brought forth by the movie as well. Among the many books that have been made into movies, this spirit could be one of the reasons Chemmeen is still celebrated. C. S. Venkiteswaran. Chemmeen: 50 Years Of a Classic. August 13, 2015.
http://www.thehindu.com/features/friday-review/malayalam-film-chemmeen-completes-50-years-of-its-release/article7530129.ece Accessed on Jan 1, 2018.